This month marks 50 years of Doordarshan’s existence as a public broadcaster. While the media scene has completely changed from the days Doordarshan first started transmission from a makeshift studio in 1959, the significance and concept of public service broadcasting is even more relevant now. Yet, it has played a crucial role in providing information, education and entertainment to most Indians. This often results in the common misconception that Doordarshan represents public service broadcasting in India. Constrained by the organizational set-up of Prasar Bharati, the concept or vision of public service broadcasting in our country has taken a different meaning altogether. Anything low on production quality and/or on development issues is now construed as public service. The current dilemma of public service broadcasting is linked to our assessment of two core principles—one, its value and importance in our country, and two, autonomy and independence of such a system. There are many reasons for justifying genuine public service broadcasting, including the argument that it is a powerful instrument of social, cultural and political development rather than just an alternative consumer service. There are numerous studies to showcase system-wide and positive behavioural changes triggered by good programming. Some examples of such memorable programmes on Doordarshan include Hum Log, Udaan, Rajani, Jasoos Vijay, Kalyani Health Magazine, Haath se Haath Milao and Kyunki Jeena Isi Ka Naam Hai. But today, we are focusing only on the state broadcaster—Doordarshan—and that brings me to the second core principle of autonomy. The formation of Prasar Bharati was an attempt to grant more autonomy and freedom to Doordarshan and All India Radio (AIR). However, these hypothetical attempts only added to the structural woes of these large organizations. Even today, managerial and editorial autonomy is a distant dream for Prasar Bharati that continues to be tied to the ministry of information and broadcasting and the fancies of the ruling political party. The issue of autonomy is usually correlated to funding. Despite receiving financial support from the government, there are independent organizations, such as the judiciary and the Election Commission, that are directly accountable to Parliament. In fact, funding a public service broadcasting system should be constitutionally guaranteed and de-linked from the vagaries of political change and decision-making. This detachment from the government will also introduce much-needed professionalism and transparency in Doordarshan. The significant achievements and innovations made till date by Doordarshan are often overshadowed by inefficient organizational structure and systems. In fact, the greatest strengths of Prasar Bharati—its talented human resources, extensive hardware and facilities, rich archival programmes and countrywide network—are also its liability in the current organizational set-up because its increasing costs and maintenance burden are eating into its precarious budgets. 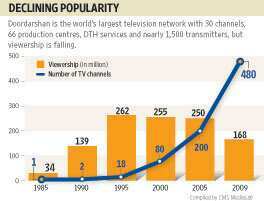 One indicator of this shortcoming is the declining popularity of Doordarshan. The graph is showing small dips in recent viewership data, reflecting what most of us already concede—that Doordarshan is losing ground to private channels. Of course, Doordarshan still maintains an ample lead in viewership among all broadcasters primarily due to its advantage of being a terrestrial broadcaster and its extensive network built over the years. The best gift Doordarshan can get on its 50th birthday is much needed independence to emerge as a thriving public service broadcaster relevant to our democracy.